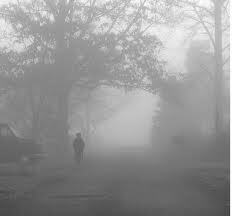 When I was a kid, waiting for the bus in the morning, I would see the denser fog farther down our street. So I’d run down to it so I could see what it was like in that thick, cloudy part. But–every time–when I made it to the patch, it looked exactly like the place I had started. Only then, that old spot was thicker. Of course, I understand the whole thing now, but back then I was perplexed. In elementary school, I had nappy hair, too-big adult teeth in my child mouth, and tons of freckles. My mama called me “Benjie”–a shortend version of my middle name. Of course, when the “Benji” movies came out, this wasn’t such a good thing…I switched schools a lot because we moved around so much. With a new community, house and school in 4th grade, I reinvented myself as “John”. I’ve had a few other reinventions since then. Lucas isn’t even officially my name, but it’s what I currently go by.